A graduate of Arcadia University, Prentiss Halladay has been painting in acrylics, oils and watercolors for over 30 years. 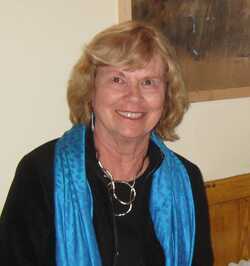 She studied art at Piedmont Virginia Community College and at the University of Virginia and has participated in workshops under the auspices of Frank Jennings, John Szekes, Elaine Hahn, Tony Couch, Catherine Wilson Smith, Don Andrews, Tony van Hesselt, Margaret Hoyback, Fran Larsen and Judy Betts, among others. A native New Englander, Pren moved to Southport in 2004 from Illinois where she taught watercolor workshops for the Prairie Art Alliance. In the mid 90’s she taught art for the Pittsylvania School System in Virginia. She has won awards for her work in Charlottesville and Halifax, Virginia, in the Sangamon Watercolor Exhibit in Springfield, Illinois and more recently won the Oak Island, North Carolina Beautification Painting Contest for her watercolor “Flowers and Light”.